ATLANTA — A bill that would severely restrict abortion in Georgia would transform Atlanta from a go-to for women terminating pregnancies to a much more complicated place. The "heartbeat" bill passed the Georgia House last week. In metro Atlanta, abortion providers aren't flashy, working typically out of nondescript storefronts like the Feminist Women's Health Center on the edge of Brookhaven. Acitivists say there are about nine abortion clinics in metro Atlanta. The number varies. Current Georgia law allows abortions up to 20 weeks of a pregnancy. The bill that passed the House Thursday would reduce that to about six weeks "because they're saying (it would be illegal) whenever a heartbeat can be detected. That's typically around six weeks. That's before most women know they're pregnant," said Laura Simmons, Georgia state director of the National Abortion Rights Action League. Simmons says women from as far as Mississippi travel to Atlanta abortion clinics – typically to take medication that terminates early-stage pregnancies. Surgical abortions are done after 10 weeks gestation. 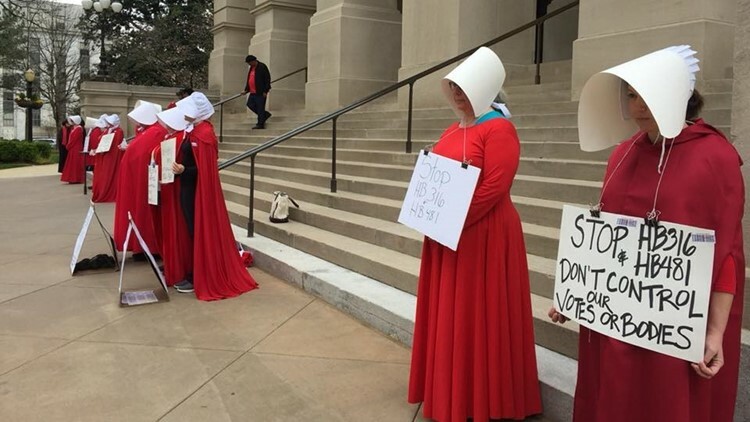 Outside the Georgia Capitol, protesters dressed as characters from "The Handmaid's Tale" protested HB 481. Some held coathangers to dramatize a crude tool women sometimes used before abortion was legalized. Women dress as characters from "The Handmaid's Tale" to protest HB 481 - Georgia's "heartbeat" abortion bill - outside the state Capitol, Monday, March 11, 2019. "You had people doing self-induced abortions in ways that were horrendous," Simmons explained. Virginia Galloway has spent years lobbying Georgia lawmakers to restrict abortions - and says the heartbeat bill is overdue. "I can't account for what people will do and how they'll do it," she said, when asked about the use of coathangers prior to the Roe v. Wade legalization in the US. "I just know that the right thing to do is not for the state to be okaying this practice. It's a barbaric practice that never should have happened in the United States of America." Abortion rights activists fear that the momentum at the Capitol has turned against them. Gov. Brian Kemp has already said he supports the legislation. A senate committee hearing is likely later this month. It could be fiery.